Seated alongside the most significant tools of any angler’s collection is a Gps Fish finder unit. This eliminates the need for purchasing two separate units, and has the same features as both. The inclusion of GPS and Sonar makes it possible to calculate your exact location, locate fishing spots, docks and wrecks, and getting home safely from your fishing adventures. Besides, it is very essential in regularly snatching more and larger gamefish. These units extend from basic units that display basic depth and temperature information, to those that have readable 3D Lake Maps and other integrated downriggers and autopilot capabilities. GPS Navigation: With the inclusion of a GPS System in your fish finder, you’re given the ability to track your exact location and plot your way to any location. Most fish finders come with detailed preinstalled maps, which allow for better navigation through possible impediments. Saving Waypoints: Today, there’s a feature for storing waypoints on most fishfinder GPS devices. More high-tech models have the ability to capture and store screenshots. It plays a vital role in helping fisher folks to tag multiple fishing hotspots for future reference, and backtrack to those locations at a later time. Thermal Images: Some advanced models flaunt thermal imagers with water temperature sensors, which help to pinpoint depth variations in water bodies and identify specific types of fish more easily. It also displays the transition layer between warmer mixed water at the surface and cooler deep water below. Depth Finder feature: If you’re having trouble finding a specific type of fish, then the Depth Finder feature is your friend. With this feature, a deep scanning exercise is carried out to determine which kind of fish is attracted by a certain depth of water. You can also determine the precise depth of the water surrounding the boat. The Garmin EchoMap 43dv superbly shows why Garmin is of such high rank and the reasons behind its success. To begin, it sports a WQVGA, high-contrast color 4.3” display, with a 480×272-matrix. It also has an adjustable backlighting feature, and in company with the swivel mounting option, makes certain that images are clearly viewable, despite of environmental light conditions. There’s also a feature microSD card slot for storing waypoints, and capturing and storing screenshots. This single microSD card slot also allows for memory expansion, if one chooses to save accessory maps such as the LakeVu HD Ultra or the BlueChart g2 Vision. This preinstalled LakeVu HD mapping architecture provides over 17,000 highly detailed lakes, reservoir and river maps. The Garmin 43dv comes with 77/200 kHz dual-beam integrated sonar, which uses a single transducer. This gives you a photo-quality image up down to 750 feet beneath the water’s surface. With Auto Guidance, you can choose your destination and you’ll get an effective and secure passageway for you to travel. You can also assess threats that may appear along the way, and also perform arrival-time computations. All things considered, the Garmin EchoMap 43dv is useful for persons who like to fish in lakes and rivers. Amongst the newest Raymarine fish finder models is the Dragonfly 4 Pro, which is an upgrade from the Raymarine Dragonfly 4DVS with its Navionics and U.S chart plotting features. With reference to mapping, it is equipped with a US C-Map Essentials pack, which includes all crucial navigation assistants and chart devices, tidal information, C-Marina symbols, and coastal data showing all depth contours and shading, and up to 60 feet of spot soundings. It also uses a 72-channel internal GPS/GLONASS architecture with 72 channels, which economizes a maximum of 15 tracks and 3,000 waypoints. The Raymarine Dragonfly also boasts a microSD slot, which makes it possible to perform multiple upgrades, such as up-to-date, high-caliber maps from Navionics. Also, future software updates which may increase the overall functionality this unit. The built-in Wi-Fi functionality is also a crucial feature. This helps to augment the unit’s functionality, and ease of operation. 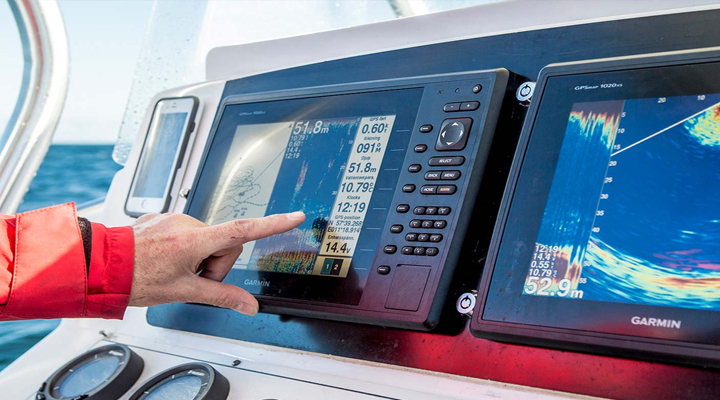 The Raymarine Dragonfly 4 also facilitates the running of multiple application instances concurrently, in split-screen. The CHIRP sonar mechanism featured in this unit provides excellent clarity of the bottom structure in DownScan and allows you to better separate fish, and bottom structure, in dual sonar modes. All in all, the combination of features offered by the Raymarine Dragonfly 4 Pro is everything that any angler looks for in a fish finder. Humminbird Helix 7 SI From one of Humminbird’s inaugurated and most up to date fish finders in the Helix family, comes the Helix 7. The Humminbird Helix 7 sports a clarity-enhancing, glass bonded 256-color, 800×480 pixel TFT LED backlit display which allows for more undemanding navigation and fishing, by providing more space, via its high-definition split-screen display. It also has a double-sized memory which allows for increased speed in drawing maps and also decreases screen flickering. In comparison to the Humminbird Helix 5, sonar images will have better quality and the maps will be quickly updated as you travel at a high speed. The Humminbird Helix 7 SI GPS stands as in the company of the most encompassing devices in the of Helix product line. It showcases Down Imaging, Side Imaging and SwitchFire Sonar features, in addition to the conventional DualBeam Plus feature. It also boasts one of the finest GPS systems. Therefore, you can go out and get your game on, no matter the target or condition. Keep up with your every move and uncover fish and structure with the Helix 7 DI GPS. This fish finder was unveiled by Humminbird among its series of fish finders. It features a 7 inch, 256-color LED screen 16:9 display, with a 480×800-pixel resolution. This combination works together to provide crisp and high-definition images and split-screen views of the water depths. There is also a Micro SD card slot available for storing maps or waypoints. Along with its definitive, built-in GPS system, which offers over 50 routes and over 2500 waypoints, you can retrace your routes to your most fruitful hotspots, repeatedly. The Humminbird Helix 7 DI GPS stands as one of the most encompassing devices in the of Helix product line. It also boasts one of the most exquisite GPS systems. Therefore, you can go out and ‘turn on the thrill’, no matter the target or condition. Many manufacturers offer various GPS and sonar combo units, but as a conventional directive, smaller-sized models of up to 5 inches offer limited capabilities. However, the Garmin 547XS sidesteps these directives in some instances. With a 5-inch diagonal, 480H x 640V pixel matrix, VGA color display, and auto-adjustable backlighting capability, you can dwell in the luxury of viewing crisp and clear images of your desired target and surrounding environs, even if you’re wearing polarized eyewear. Sporting a Fish Symbol ID feature, you can use symbols to replace actual fish, or fish arches. This feature gives you an alternative with respect to certain fish targets by notifying you when there are fishes of a certain stature in view. Another feature of the Garmin 547XS is Depth Alarm, which operates in an equivalent fashion to the Temperature Alarm. With this feature you can set a depth-limit alarm notification upon reaching an established deepness. This can help you to steer clear of shallow or threatening areas during navigation. Another immaculate feature of the Garmin 547XS is its Wi-Fi and Bluetooth connectivity. This wireless functionality allows for connectivity with your mobile wireless devices. With this, you can manipulate the unit by way of several mobile apps. Encapsulated in this small unit are a strapping sonar system and a diversity of navigation features. Offering groundwork at a comprehensive level, the Lowrance Hook 7 GPS unit suits your every need. With its exceptional design, highly dependable fish-finding and chart-plotting rendition, you can be assured that you’re getting what you really desire. Flaunting a 7-inch, 800×480 16-bit Full-Color SolarMax Plus TFT VGA LED display with backlighting capabilities, on-screen images can easily be seen in full sunlight, from vast viewing angles. The Multi-Window display feature offered by Lowrance, allows you to swiftly select from a wide range of preloaded page layouts, which includes a 3-panel view. This allows for smoother and more undemanding one-thumb navigation through software features. The Hook 7 is also furnished with Lowrance’s state-of-the-art Chirp Sonar and DownScan Imaging mechanisms. These technologies are today’s leading powerhouses of fish-finding technologies, and work together to give you a clear view of what actually lies underneath you both. By virtue of its highly accurate integrated GPS feature, travelling back to your favorite fishing hotspots is made more unchallenging. There are detailed preloaded maps that come with the GPS unit, which features more than 3,000 lakes and rivers. You can also track back to inspect recorded sonar history. The Lowrance HOOK 7 is a passable unit, which showcases its effectiveness in both fresh and deep water. All things considered, it’s a medium-sized model, with a breathtaking assortment of attributes, which makes life easier for the typical fisherman. The SI GPS is the front-runner in the Humminbird Helix 5 product line. Similar to more advanced models, it flaunts sophisticated imaging capability features such as Down and Side Imaging, DualBeam Plus 2D sonar and GPS mapping. However, only 455 kHz Down and Side Imaging is supported. For such an economical fish finder, the SI captures images with exceptional quality and features a Compact SI transducer, similar to that included in the Humminbird 899ci SI. LakeMaster mapping cards, along with AutoChart self-mapping software are all compatible with the Humminbird Helix 5 SI GPS. Like the variants in the Humminbird Helix 5 series, the SI GPS will work with HotMaps and Navionics Gold. The Helix 5 DI GPS is similar to the SI variant, but only with 2D Sonar and Down Imaging abilities. It sports a mind-blogging 800H x 480V, 5-inch 256 color display, along with backlight capability. It also features Down Imaging and DualBeam PLUS sonar, which have a Peak-to-Peak power yield of 4000 watts and Precision Internal GPS Chartplotting, together with integrated UniMap cartography. In addition, there is a micro SD storage feature which allows for the storing of maps or waypoints at one’s own discretion, in company with a gimbal mounting system. Broaden the horizon of your angling adventure by being allowing the Humminbird Helix 5 DI GPS fishfinder to be your best friend. Lowrance is back at it again with their new Elite 5 HDI series, which fuses the best of Lowrance technology into a stunning fish finding package. Boasting a 5 inch, 480×480 pixels Full VGA SolarMAX™ PLUS LCD, you can see crisp and clear details of bottom structure and schools of fishing swimming by. This is all you’ll need for retracing routes, and waypoints or to view your exact location on a map. In recent times, you had to make manual tweaks and adjustments in order for you to achieve ideal readings. However, with the Advanced Signal Processing Technology that comes with the Elite-5 HDI Combo unit, readings and Sonar settings are automatically determined to allow for more enhanced visibility of fish and bottom structure. Packing a powerhouse of 250W and 30,000W Peak-to-Peak, it is possible to see as far as 1000 feet below, at a frequency of 50 kHz. It also has a microSD slot for storing additional maps for faster viewing. In addition, it comes with a 12-month warranty. The Lowrance Elite 5 HDI is an exceptional fish finder for fisher folks who wish to have all the features that come with more expensive models, but in a compact and cost-effective package. Screen Size: Screen Size is prime facet which should be given thought to. A 5-inch screen is always recommended at the minimum for permanent installations and then upgrade based on your desires and level of experience. Widescreen display is also an inclining attribute which allows you to have a greater span of view and it also enhances the picture quality of split-screen displays. Screen Resolution: The number of pixels in your fishfinder’s screen display is also a crucial point to reflect on. The greater number of pixels there are, the more detail you can see. At minimum, you want a 240V x 160H pixel screen. Even then, the image will be pretty blocky. For sharper images, it’s worth providing capital for a screen with a higher resolution. Screen resolution, put together with screen size will be the ultimate factor for how clear your display is. Depth finder feature: This feature will give you an idea of the depth of your surrounding so you can direct your boat in the right direction. Course charting: With the incorporation of the GPS system in your fishfinder, you are presented with the ability to determine your exact location and trace your way to any given location. Contour lines: On all parts of the chart you will discover scrawled contour lines which represent variations in depth. These allow for the visualization the structures like humps, drop-offs, ledges and flats. For a fisherman, this overall information is crucial, as it aids in the detection of areas which contain the fish. On either side of contour lines, there’s some proportion of spacing. Contour lines that are widely spaced display a restrained decrease in depth, while those that are relatively close together stipulate a greater depth variation. Zooming: Supplementary features to be had on fishfinder GPS combos incorporate vivid LCD displays, sonar and mapping GPS. These types of devices can even locate fish that are camouflaged in sea weeds, or behind structures. To locate them, you can use the zoom feature to get a better look on any object you are tracking that is at a great depth in the water. Wrecks: On nautical charts it is also possible for you to examine the depth and GPS coordinates of wrecks. Oftentimes, fish are attracted by wrecks, but not all the time. Some have deteriorated too much over time, while others have been sanded over completely. Save locations: Majority of the GPS fish finder devices feature waypoint saving. It’s really helpful for fishermen to save their favorite fishing hotspots and then easily re-routing to them in the future. GPS technology can be a substantial tool and a must have for any boat. If you are also a fishing fanatic, you will also require a fish finder that will provide assistance in catching fish. Therefore, if you require the two devices, why not get in a single unit. However, the most significant growth is developing fresh ideas on the ways in which this technology can be implemented. This cost-effective tool can limit the amount space you’ll need for storing your fish-finding equipment. In addition, it makes it advantageous to possess all the required equipment at the blink of an eye.